We all target the same prospects! I hear this a lot in the high-tech marketing world. Organisations tell me that when they are prospecting they and their competitors target the same organisations and the same people. I want to highlight how assumptions like this can be very dangerous in competitive marketing. It’s lazy to assume that your closest competitors are saying the same thing to the same people as you are targeting. Sure there are major similarities in most highly competitive markets but when Lustratus studies the protagonists and their relative offerings in detail we always find significant clear blue water between them. We developed the REPAMA methodology to bring a little clearer insight into competitive marketing. 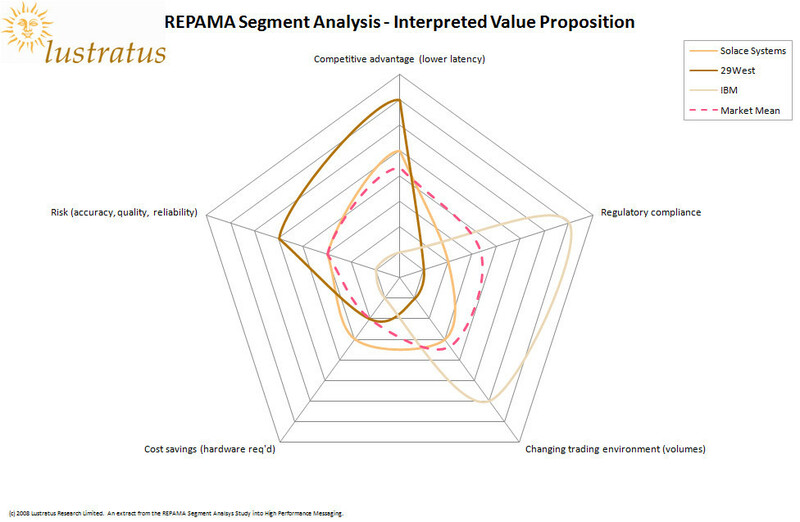 We’ve recently completed a REPAMA Segment Analysis Study (SAS) on a subset of the High Performance Messaging market. There are some really interesting things going on at the moment in that market. Some really clever software and network architecture techniques are being used to remove the delay between one application sending a message and another application receiving it. In addition dedicated FPGA hardware is now being used to replace software servers. The primary beneficiary of this capability (minimizing the delay) is the financial markets where saving time exchanging information can literally translate to millions of dollars lost or gained. We were asked to look at IBM’s WebSphere MQ Low Latency Messaging (LLM), Solace Systems’ Content Router and 29West’s Latency Busters Messaging (LBM). Prior to starting the analysis we were led to believe that “we all target the same prospects”. Whilst it is true that there is massive similarities between the strategies of the respective competitors, there is also significant, subtle as well as not so subtle difference. The image above (click for a larger image) shows the ideal target customer as inferred by the language of the vendor in their outbound marketing activities. This puts a lie to the argument that “we all target the same prospects”. In reality, there is a great deal of similarity in the industry of the target prospects (with the exception of the channel business of Solace Systems) but the specific targets differ significantly from company to company. Relying on a lazy assumption would almost certainly result in ceding market opportunities to the competition. OK so I’ll close out with two very interesting charts (well they’re interesting if you’re a marketing analyst). The image above (click for more detail) shows the features and benefits that they various vendors ascribe to their products and services. As you’ll see, there is a high degree of correlation between them. In fact you would assume that when they are in front of a prospect, each of these individual companies would be saying much the same thing and that their arguments would be indistinguishable from each other. That may well be true whilst they are talking about the technology and its features. There is certainly a high degree of correlation. However, once the vendor interprets these features into benefits that the business would enjoy, the picture shows a different story. Here, in the diagram above (click for more detail), we can see significant differences in the value ascribed to the respective products by their respective owners. Well if the vendors sell on technical features to technical people then there are similarities that will likely only be resolved by comparing the products in detail and perhaps looking at the specific performance through benchmarks or evaluations. However if the vendor sells based on the value of the technology to the business in business terms, then we can see that the vendors are very different in their approach. As part of the study we also infer the place where the vendor looks to start the sales process as well as their likely commitment to value-based selling. So “we all target the same prospects” might be true in once sense but it takes a detailed analysis of the picture to really infer how organisations actually take their products to market. Lesson? Never assume that you know what your competitors are doing just because you know what you do. They will be different. Better? Worse? Well that depends. But knowing that there is a difference is the first step in building a “better” story and selling more. And remember “different” makes it easier for prospects to make decisions. Posted in All Blog Categories, communication, high performance middleware, marketing, Marketing Strategy, positioning, Vendor-Related Posts and tagged 29West, ibm, Latency Busters Messaging, LBM, LLM, low latency messaging, marketing strategy, messaging, middleware, positioning, Solace Content Router, solace systems. Just a note to say that I did change a typo, but quite a significant one. The good people at 29West pointed out that I referred to their Latency Busters Messaging product as LLM instead of LBM. Our lawyers have asked me to point out that I have no specific knowledge of any impending IBM acquisitions.